More information about chicken jerky treats. Only NBC Bay Area has the results of new tests conducted on a Morgan Hill woman’s dog that died within 48 hours of eating chicken jerky treats, plus we analyze the FDA’s most recent database of complaints to find out which brands top the list. Only NBC Bay Area has the results of new tests conducted on a Morgan Hill woman s dog that died within 48 hours of eating chicken jerky treats, plus we analyze the FDA s most recent database of complaints to find out which brands top the list. The NBC Bay Area Investigative Unit's Vicky Nguyen reports. New: Voluntary recall of chicken jerky treats for cats. Click here for more information and which product is affected. Rachael Chambers’ four dogs are family. The Morgan Hill woman says it was heartbreaking when three of them became sick after eating Milo’s Kitchen chicken jerky treats made by Del Monte. Dachshund-mix Liz had diarrhea and wouldn’t eat and chihuahua-mix Jack stopped eating and had to undergo weeks of veterinary treatment for his liver. But it was Shepherd-mix Cali who couldn’t be saved. Cali died after her stomach twisted, ruptured, and exploded. “It was violent and she did not deserve the way that she died,” said an emotional Chambers. 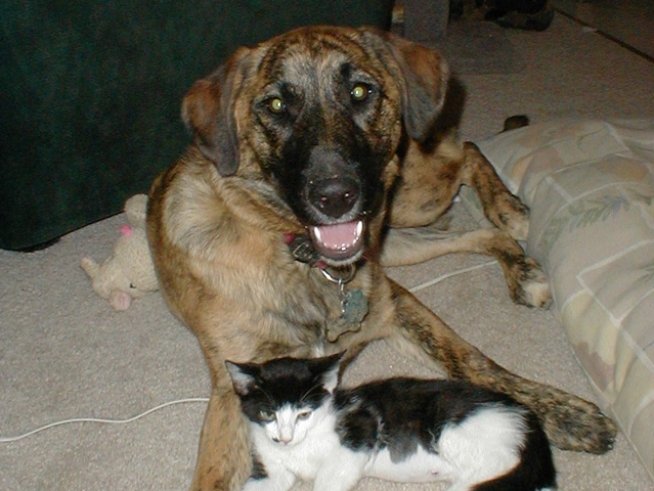 Veterinarian Jaspar Harika treated Cali and Jack initially. He says in his Morgan Hill practice, he’s seen an increase in the number of dogs sickened after owners fed them chicken jerky treats. He says he is advising owners to avoid these treats. “If they are causing vomiting and diarrhea, they are causing discomfort to the pet,” Harika said. This week, after being contacted by Chambers, Senator Barbara Boxer issued a letter to the FDA to ask why the agency has not issued a recall. Congressman Jerry McNerney is also urging the FDA to step up its investigation with this letter to the FDA commissioner. Monday, Representative Dennis Kucinich blasted the FDA, saying, "By allowing the treats to stay on the market as the years-long investigation drags on, the FDA is guaranteeing more pets will die. Why?" The full warning can be seen here. The agency has posted just 242 of the more than 1800 complaints here. An NBC Bay Area analysis found the brands with the most complaints were Nestle’s Waggin’ Train, and Kingdom Pets. Despite the FDA warnings, the treats are still on shelves at Target, Walmart, Costco, Petco and Petsmart. Craig Wilson, Costco vice president of food safety and quality assurance, says Costco carries chicken jerky treats made by Kingdom Pets and Waggin’ Train, both made in China, as well as Nature’s Deli, made by Kasel Industries in the U.S.
Petco did not respond to requests for comment. Target said it could not comment because of pending litigation. Pet owners have turned to the Internet to stop sales of these products. This petition against Nestle now has more than 66,000 signatures. Chambers has also started this petition in Cali’s memory. Bay Area chain Pet Food Express does not and has never carried the Del Monte or Nestle Purina products, but it has posted the FDA warning to educate customers. “We know our customers don’t shop here exclusively and they are going to have questions about chicken treats. We want to give them as much information as possible,” said co-founder Michael Levy. He says Pet Food Express carefully tracks customer complaints and has not recorded a difference between chicken treats from China and those from the U.S. “We would not carry anything we wouldn’t feed our own pets,” said Levy. The FDA says it has tested for bacteria, mold and chemicals in nearly 300 treats sent in by consumers, but nothing has surfaced to prompt a recall. The agency recently posted the results of those tests here. Meanwhile anguished pet owners are pursuing two class action lawsuits against Del Monte and Nestle Purina. Attorney Shawn Khorrami is suing Del Monte on behalf of Susan Webster, a Southern California woman who says her dog was sickened by Milo’s Kitchen treats. In the lawsuit, she claims the companies failed to properly investigate and test the potential toxicity of Milo’s Treats, wrongfully marketed the product, failed to warn consumers about the potential dangers and did not recall or discontinue sale of the treats. She wants the chicken jerky removed from the shelves and seeks unspecified damages. Khorrami says the suit also seeks to force the FDA to release what it found after recent inspections of the facilities where these treats are made. “The FDA has gone to China and inspected the facilities but we can’t get the results of that,” said Khorrami. The FDA says releasing those inspections would reveal trade secrets. Del Monte and Nestle say they extensively test their products for safety. Nestle even posted this video to show pet owners how the Waggin’ Train treats are made. Treat makers repeat their products are safe if fed as directed. In Cali’s case, the maximum recommended portion on the Milo’s Kitchen treat bag is between 4-5 pieces for a dog of her size. Chambers says she only fed Cali one or two treats, and her smaller dogs, Jack and Liz, were given a single treat each. “We did not give them the entire bag of treats. Even if I gave them the whole bag, if you eat a whole box of Ding Dongs you’re not gonna die,” said Chambers. Chambers says she hopes retailers will at least post the FDA warning near the products. “By…just giving me a simple advisory that said this could cause illness or death I would not have purchased that and my dog would still be here today,” said Chambers. If you suspect your pet was sickened from treats or any other pet product, you can click here to file a complaint with the FDA. Bottom line – just get blog on blog.nilesanimalhospital.com.It is a valuable site for all the men.It site help us many way day after day.Really I belief this site. It’s amazing how many lucrative jobs I’ve gotten via my blogs. Plus my blogs have been a great way to show cases my writing just as much as clips, samples, etc.As I want share They are not the best of house guests. how to get rid of rodents in the home? They can easily make their way into your home, its the removing part that can be quite difficult. They are known to invade attics, basements, lawns, and gardens. The main reason for their intrusive invasions are due to attractants such as food, garbage, and clutter from both inside and outside of homes. Especially mice are found in homes more often during the cold winter months.